The silk scarf is a soul piece when it comes out of the street. It is very versatile and practical. Today, I will introduce how to perfectly combine silk scarves with bags. 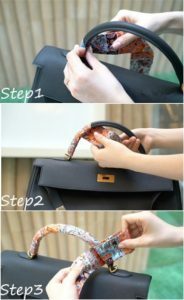 For a bag with a handle, if you want to make a mistake, the winding method is the safest. Way: First make a knot on the left side of the handle, then adjust the scarf to the back of the handle in the direction of the knot, then just wrap the scarf in the same direction and you’re done. If you think that the classic method is too monotonous, then try this twist bow method. Way: Align the lengths on both sides of the scarf, then continue to twist the twists, the girls will. 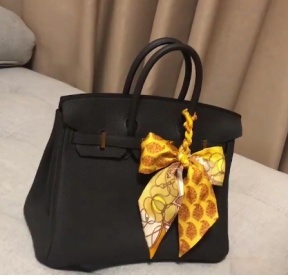 Finally, leave a tail long enough to make a beautiful bow. Look at the finished product, is it very good to see, girl heart bursting there is no! As a little fairy, in addition to a large bow, you can also wear a small delicate bow. For example, the following small bow tie method has both the simplicity of the winding method and the delicateness of the bow. Method: press one end of the silk scarf tightly, then wrap around the handle tightly. 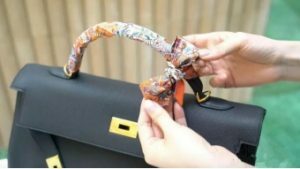 Be careful not to show the head of the silk scarf; then continue to wrap the silk scarf tightly until it reaches the end of the handle. 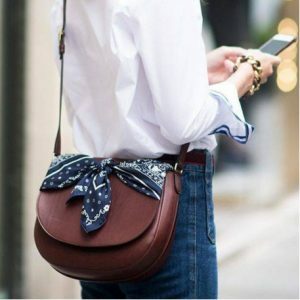 For a long period of silk scarf, it is OK to tie a bow. If the little fairies feel that the full encirclement will be visually too full, then try the half-handle bow tie method, such as artistic white space, more unique. 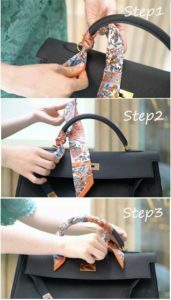 Method: place the silk scarf in the middle of the handle, and adjust and align the lengths on both sides of the silk scarf; pinch the silk scarves on both sides and wrap them together, and must be tightly wrapped; pass both silk scarves through the fixed buckle on the right side; Finally, a bow is completed. 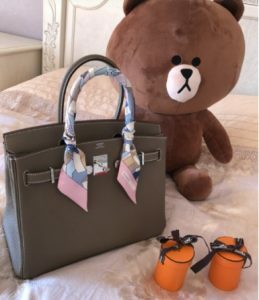 What about the bag without the handle? Is there nothing wrong with it? It’s not awkward. As long as the silk scarf is used well, you can make the monotonous body full of summer refreshing taste! Here’s how to match a scarf without a handle. Little fairies learn quickly. 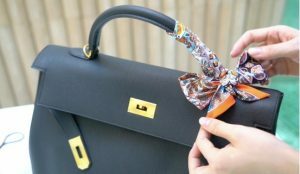 The cover method is very simple, just open the cover and attach a beautiful bow directly to the outside of the cover. Very time and effort. This is much simpler and easier to operate, just feel free to tie a knot. However, it should be noted that the two tails of the silk scarf are longer and shorter to look better. 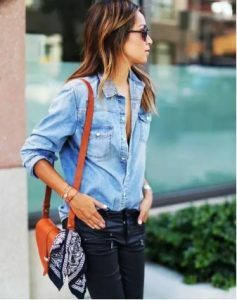 And this way, the bag with no handle is suitable, it is both casual and feminine, is it great?